Your skin ends up being a hub for germs and grime if you don't use a bathing soap. 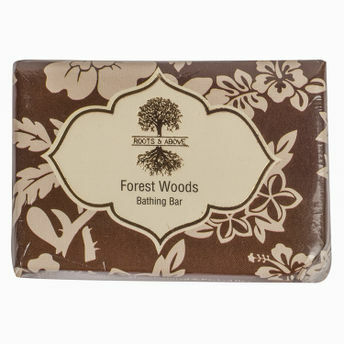 Roots and Above Ayurvedic brings you Forest Woods Glycerin Bathing Bar which is designed to provide deep cleansing to your skin. This organic soap provides personal aromatherapy through exquisite aromatic oils like Sandalwood, Vetiver and Agar Wood oil. Long-lasting aromatic oils leave skin feeling fresh and supple. Removes scars and stretch marks. Safe and natural soap which you can use every day. Include Roots & Above Ayurvedic Forest Woods Glycerin Bathing Bar to your bathing routine for smooth, supple and healthy skin.